LAST OFFICIAL EDUCATION EVENT OF THE TERM!!!!!!! 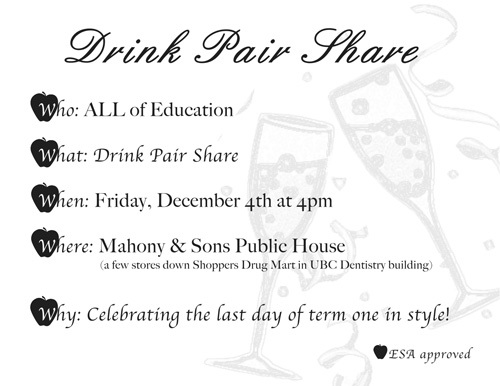 DRINK, PAIR, SHARE – December 4th at Mahoney and Sons 4pm. Last day of classes. We have rented out part of the restaurant and have it rented all night long. So come out for some drinks and some great pub food. If you feel like participating in some holiday fun WEAR YOUR UGLIEST, CRAZIEST HOLIDAY SWEATER. There will be prizes (education merchandise and Starbucks gift cards)!